Holly plants provide glossy, deeply cut leaves and brightly colored fruit year around. Their ease of care makes them popular choices for gardeners in temperate to warm ranges. Growing Nellie Stevens holly trees provides you with one of the fastest growing of the hollies with branches packed with berries. The Nellie Stevens holly plant is a hybrid of Ilex cornuta and Ilex aquifolium. It has an interesting back story and an even more interesting growth form. Hollies are timeless classics that make a large impact on the landscape with very little special care required. These easy-to-grow plants provide cover and food for birds and natural holiday décor for the home. Nellie Stevens is a happy accident between a Chinese holly and an English holly. It was grown from berries filched by Nellie Stevens in the early 1900s. The resulting plant was almost removed in a home remodel in 1952 but was subsequently saved. Among this plant’s many attributes is its natural pyramidal form. It can grow up to 25 feet when mature and is one of the heaviest bearing of the hollies. Leaves are 2 ½ inches long with 5 to 6 deep teeth on each side and glossy green coloring. Much of the fruit seems to set without a male – Edward J. Stevens is the name for the male plant in the species – plant’s intervention (parthenocarpic) and numerous pea sized, red berries appear in fall. These plants are dense and make a nice screen and can be grown as either multi-stemmed or single stemmed plants. The plant was finally discovered by Nellie Steven’s niece who took seeds to the Holly Society annual meeting for identification. The plant couldn’t be identified and a new species was named. This holly is very adaptable to either full sun or partial shade locations. It is resistant to deer and rabbits and will develop drought tolerance with maturity. The tree even thrives in poor soil and doesn’t mind mild neglect, though plants prefer slightly acidic well-drained soil. Nellie Stevens is suitable for gardens in United States Department of Agriculture zones 6 to 9. It is a fast growing plant and useful as screen due to its thick foliage. Space plants 6 feet away when growing Nellie Stevens holly trees for a hedge effect. This holly is also remarkably resistant to most pests and diseases with the occasional exception of scale. This has become a popular plant in cultivation since its introduction. 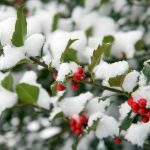 This is partly because Nellie Stevens holly care is minimal and the plant is resistant to a host of bothersome conditions and pests. Many gardeners may wonder, “Are Nelly Stevens berries poisonous?” Berries and leaves can be dangerous to small children and pets, so some caution should be used. Fortunately, the plant takes to shearing quite well and, although it forms a lovely shape naturally, pruning can help minimize berries at the lower heights. The best pruning time is early spring before new growth emerges. Most plants do not need regular fertilizing but optimum health can be maintained with a granular slow release food of a 10-10-10 ratio.